Projects 2016: Aquaponics, and a boat! Last year, I didn't get to do much in the way of fun hobby stuff. The lion's share of my extra time and cash went into building a loft over my living room (my new office! ), furnishing that loft, and working on other home maintenance and improvement projects. This year's project fits in with that theme. A few months ago, I decided to rethink my aquaponics system. I decided it was time for a massive overhaul. Part of this decision was due to the fact that I want to expand my tiny galley-style kitchen into a more functional and comfortable space. In order to do that, I'll have to push out onto the back patio, which is where the fish tank for my aquaponics system had been located. Right around the corner was my greenhouse, where my wife and I grew tomatoes, peppers, lettuce, kale, cabbage, potatoes, and on and on... Now, all of that is gone. I decided to dial back the aquaponics a bit in the process. It's a great hobby, and frankly a technology that I believe can help save the world (I'm not exaggerating), but I really don't have the space for it here, nor do I have adequate sunlight in my small backyard. 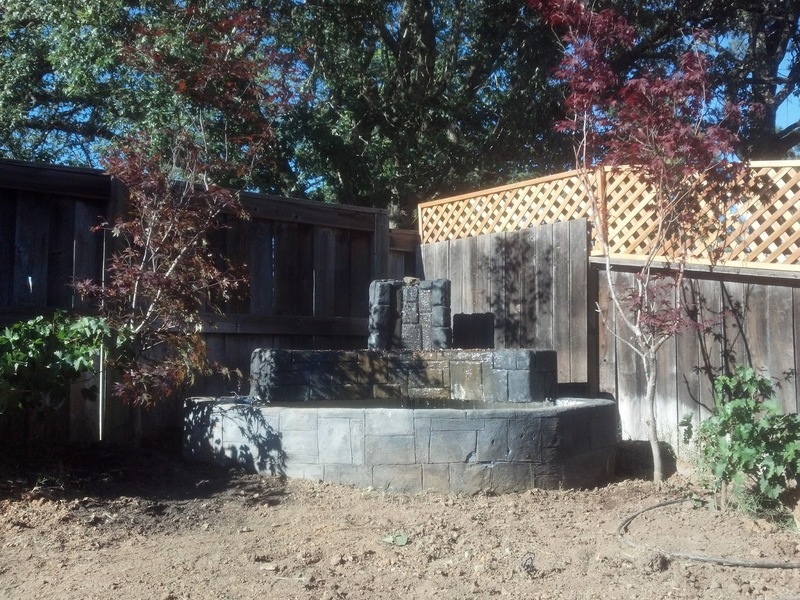 I decided to do something that would be nicer for my remaining fish (two large koi) and integrate into the design a grow bed for a small herb garden or something along those lines. As you can see, I dug a hole about three feet deep in the corner of my yard for a new fountain/pond. I built forms out of lumber and plywood, which turned out to be far more complicated than any masonry work I've done in the past. Shaping concrete into curves and tiers like that is a nightmare and I never want to do it again. (Well, maybe. Ask me in a few years.) 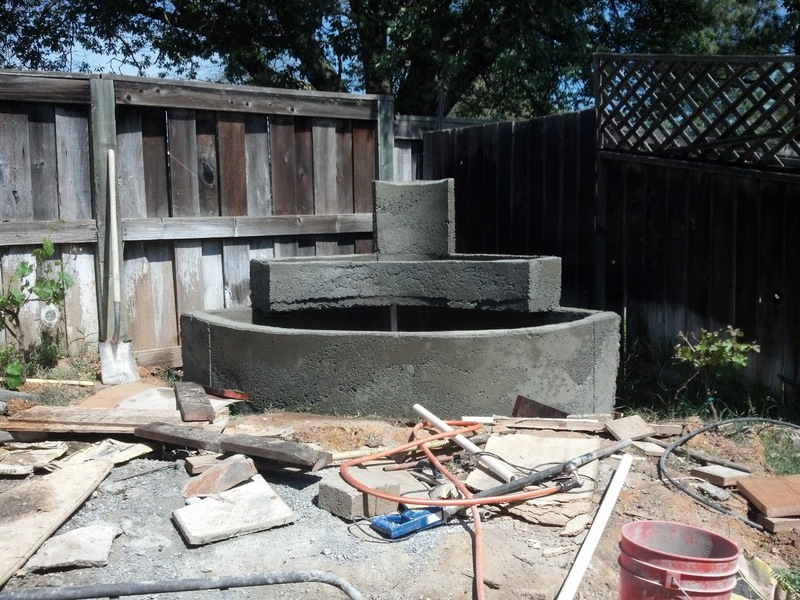 To further complicate matters, I went with a serious design: four to five inch thick walls with rebar. Yeah, this thing ain't going anywhere. Ever. 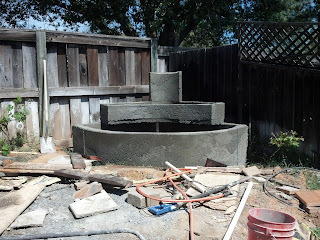 After pouring the concrete, I cleaned up the edges and smoothed it all out with a stucco finish. At this point, I could have painted it and let that be the end of it. After all, it's a perfectly decent design. It would look nice next to a fashionable contemporary or art-deco home, but my house is a farmhouse type, so I wanted to go with something a bit more nostalgic. Since then, I've tilled, landscaped, and reseeded the grass. 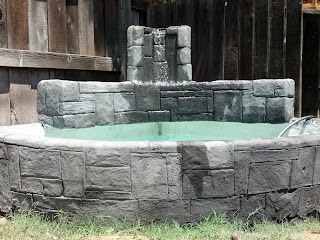 I also had to rebuild the sprinkler system, and I'm now trying to figure out what to do with the rest of the yard to make it a little more harmonious. 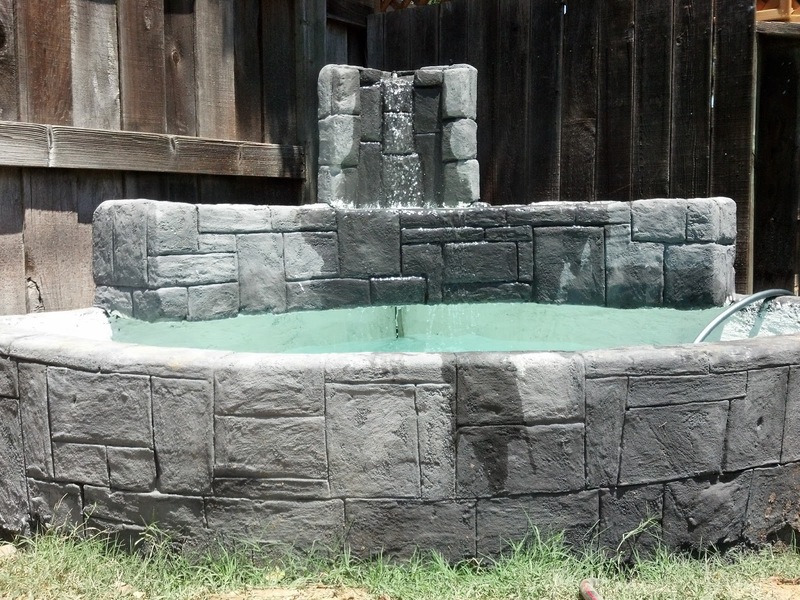 I'll probably add some cobblestones around the base of the fountain to complete the look, and I'm considering rebuilding my old shed at the opposite end of the yard. But for now, I'm tired... I just want to relax and enjoy life for a while. Which brings me to the next part of my story. Actually that's not my boat, but it's the same model. Mine is a different color and it no longer has the original full-length top, but it came with a ton of accessories, including the factory 115hp outboard motor and a second trolling motor. It's a little funky-looking -you don't see many of this design around here- but it meets all of our needs, and I think it will be a great starter boat. 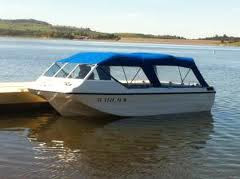 The hull is in incredibly good shape, and according to the seller, the engines are in fantastic shape. I haven't had a chance to test them yet because I just got it, and I've been busy repairing the boat's one minor flaw: a rotted floor section in the back, near the transom. Thankfully, after pulling back the carpet, I found the culprit to be a rotten piece of plywood about 2'x2'. I pulled the rotten wood out, replaced the rotten support underneath it with a heavy piece of aluminum plate, and I'm fiberglassing the replacement wood today. Tomorrow, it will be back in one piece, and ready for the water, "God willing and the creek don't rise," as my father likes to say. The truth is, I made the repair a little more work than it had to be. I could have slapped in a piece of plywood and it would have been good for a few years. But I'm of the opinion that if you're doing the work, you should do it right so you never have to do it again. Trust me, this floor won't rot again for a long, long time. It'll probably outlast the rest of the fiberglass hull surrounding it. So that's the status of my summer. I hope you're all having a great one, with no landscaping, and lots of water sports, or whatever else it is you like to do this time of year! As for me, I'm chomping at the bit to get this beast out on the water and put all of my projects behind me for a while.